Two recent Northwestern University studies shed new light on the mystery of the leading cause of birth defects and miscarriage, laying the foundation for further research in an understudied but crucially important field of genetic study. The studies look at what happens during the process that produces egg cells (oocytes), which later become embryos when they are fertilized. Ten to 25 percent of human embryos contain the wrong number of chromosomes because the egg cell has not divided properly, which is a problem unique to egg cells. These mistakes are the leading cause of miscarriages and birth defects such as Down syndrome, and the incidence of these errors rises dramatically as women age. Understanding why egg cells are more prone to this division error is critical, given that women are increasingly choosing to start families at later ages. The first study, published in the Journal of Cell Biology in March, revealed that oocytes use an innovative strategy to detect and prevent errors during cell division, while the second study, published in PLOS Genetics, identified new proteins essential for the cell-division process and discovered that a backup protein kicks in when the division is failing to help ensure the embryo is receiving the correct number of chromosomes. Wignall researches a structure called the spindle, an elaborate football-shaped structure that physically separates the chromosomes during cell division. In most cells, structures called centrosomes help to organize the spindle, ensuring that it can precisely separate chromosomes to send the correct number of chromosomes to each newly divided cell. 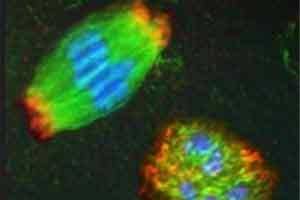 Spindles in egg cells, however, lack centrosomes. This “acentrosomal” process is highly understudied compared to other types of cell division, leading to important unanswered questions about why it is much more prone to error when dividing. In the study published in September, Wignall and her team discovered that in the absence of centrosomes, two proteins KLP-15 and KLP-16 were essential for dividing the cells. The researchers knocked out these two proteins to find that instead of forming the normal football-shaped spindle, the spindle structure collapsed into a messy round ball. Much to their surprise, despite this early defect, a backup protein then jumped in and helped separate the chromosomes to the two ends of the cell. “We were surprised to find that this protein came to the rescue and worked as a backup to properly organize the spindle,” Wignall said. The question remains why 10 to 25 percent of embryos still end up not being viable if there is this backup process in place in oocytes. One theory, Wignall said, is that this backup protein changes or depletes as women age. Wignall performs her research on oocytes using small worms called C. elegans since they are a powerful research organism for genetic studies. However, her lab is also building on these findings to perform parallel studies in mice in collaboration with Teresa Woodruff, a reproductive scientist and director of the Women’s Health Research Institute at Northwestern University Feinberg School of Medicine. The next step will be to study these mechanisms in human oocytes. Funding for this research was provided by the Damon Runyon Cancer Research Foundation and the March of Dimes Birth Defects Foundation (grant number is #5-FY13-197).